Oddly enough his character's name in Oz was Jeremiah. I've still never seen Jeremiah, but I grew up with and watched 90210 as well as Oz, one of my favorite shows. It was definitely a shock and sad that he passed at 52. Real-world inspiration for Babylon 5 station? 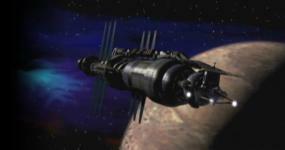 Re: Real-world inspiration for Babylon 5 station? You beat me to it. I was going to post this. It was certainly great to see him in something so recent as GOT. He definitely had a great career. Roy Dotrice, who played Frederick Lantz in 'The Fall of Night', passed away at the age of 94. Yeah, I don't think I'd be able to do two re-watches at one time. I barely have time to watch one show once at a time! I'm with you on it being hard to determine the passages of time. At times it's really hard to distinguish. Overall though, a nice start to the season! Old timers eh? Haha! It is great to see so many from the beginning, or close to it. "Hell, I'll probably still be here when they turn out the lights!" Has JMS said anything about Furst's passing? I haven't really looked but I thought someone here might have read about his reaction or comments somewhere. I still vote, fight! We've definitely seen a small resurgence. LondosHair, it's awesome to see you popping back in here. How long has it been? Seems like many years to me! I hope you've been well. That is sad news. Luckily, his memory will forever live on through one of the greatest television shows of all time. I've still never seen the original, but I own the entire series of the newer one. I'll have to check it out sometime. Any idea if it's on Netflix or Amazon Prime? It's always nice to see a B5 reference dropped, especially when you're not expecting it! It's starting to feel more and more like a reunion! I hope more start popping up. Solaris, did you grow up? Hey hypatia! I actually check in almost daily, it's just that my posts aren't quite as frequent! I love seeing the old faces around here. Just another reason to keep this place going in my opinion! I would love to get this but unfortunately I don't have the extra funds at this time! I don't think I've seen you around here in years tygirwulf! How've you been? That's pretty sweet. I might just have to pick it up! RIP. I just came here to post that myself. Another great character actor to go beyond the rim. I just randomly came across and saw that Aubrey Morris passed away a few days ago at the age of 89. For those of you who may not recognize the name he played Duncan in "Exogenesis". Passing of Efrem Zimbalist, Jr.
Re: Passing of Efrem Zimbalist, Jr. Sorry to hear this news. I just finished watching B5 again a couple weeks ago and actually looked up his bio knowing that he was still alive. Strangely enough I just finished watching it again Friday. RIP "Wild Bill"
It's kind of funny that you posted in this again as I've just started watching it again...for literally probably the 50th time! Breaking Bad was a great show. I can't say I ever imagined Bruce or Jerry in those roles but that would have been interesting to see. I just finished reading about this. Sad news.